If you’re reading this I hope you’re settling down with a cuppa on your bed and a huggable puppy by your side because this is gonna be a long one. I don’t normally write posts about beauty so this is when it has all built up and just comes out in the form of one blog post. Let me start off by saying my skin is very temperamental. It has been everything from oily to dry, and very, very blemish prone. nice. But recently I think it’s been improving. I drink a lot of water – maybe even too much even! As soon as I wake up, within the first 5 minutes, I’ll down a 600ml bottle of water as I don’t drink anything during the night (obviously) so I wake up dehydrated. Following that I’ll normally work-out of sorts (depends how motivated I feel, if not very then it’ll just be stretching) as that tends to wake me up most effectively. Then I’ll hop downstairs and grab breakfast. Warning: The information you are about to read contains content where I talk very honestly about my skin type, be prepared for lots of nice moments. My morning routine is very simple. Involving only three products – one of those being water. My mum has always said “water is the best thing for skin as cavewomen didn’t have all these potions in their day and was their skin bad?” well mum, to answer that I’d need to time travel but I think she’s correct. So instead of using crazy cleansing balms in the morning I just splash my face with cold water (cold over hot in the morning to tighten my pores, and wake me up) then pat it dry before applying the one potion I can’t live without: HealGel Intensive. I have some scaring from past blemishes and this product had been sorting them out for me. I also love the smell of it and it makes my skin feel really nice morning, noon and night! told you this would be a long one. 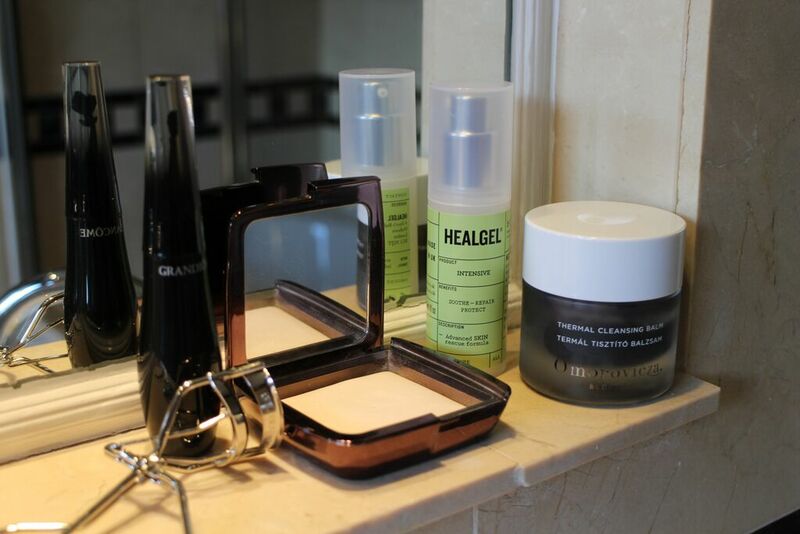 The evenings are when I like to relax, chill out, and spend more time on my skincare. When I get home evening if I’m wearing makeup or not I’ll always go for the camomile silky cleansing oil to just get off the day’s dirt. I love this stuff and am almost finished with my third bottle. Then I will double cleanse as I don’t want dirt sitting on the surface and clogging up my pores when I sleep. Nice. As I’m trying to use up all my products so they aren’t sitting there when I move out to Uni I use any one of the following cleansers: Hot Cloth Cleanser, Deep Cleansing Fix or Thermal Cleansing balm (not as often as it is very expensive, normally on a Friday night when I wanted to start the weekend fresh faced) I’d highly recommend all the cleansers I’ve mentioned as they are very multipurpose and you could use them on almost any skin type. I’ll just massage them into my patted dry skin and with a flannel and warm water take it off, once again patting my face dry afterwards. Next I like to apply the ocadite serum which I did a review of that you can see here and just relax ’til my face hits the sheets. I’m a very natural waves kinda girl so besides shampoo, conditioner, an occasional hair mask, and a serum post-wash, at most I’ll braid my locks and sleep. Wash wise I love the brands Aveda and Kerastase; a bit more on the pricy side but works wonders for my mane. I’m currently using the Aveda damage repair shampoo and conditioner to wash and post shower the Kerastase elixir ultime through the mid lengths to ends. I won’t wash my hair everyday either as my hairdresser doesn’t think that’s good – every three days for me! All in all I’d say to some I have a very complicated routine but to others mine is simple and minimal. For me I can do it quickly and easily within 5 minutes plus my skin seems to love the products I use. I think I’ll be sticking with this routine for a while. What are your three favourite products?